People as your most important asset. Your technologies, products and structures can be copied by competitors. No one, however, can match your highly charged, motivated people who care. People are your firm's repository of knowledge and they are central to your company's competitive advantage. Empower people around you. Well educated, coached, and highly motivated people are critical to the development and execution of strategies, especially in today's faster-paced, more perplexing world, where top management alone can no longer assure your firm's competitiveness. People are your firm's most underutilized resource. In the new knowledge economy, independent entrepreneurship and initiative is needed throughout the ranks of your organization. Involvement in an organization is no longer a one-way street. In today's corporate environment a manager must work towards engaging organization forcefully enough to achieve its objectives. Pentel is a Japanese firm manufacturing stationary products. The following is a list of 14 Pentel's slogans for explaining Total Quality Management (TQM) and Quick and Easy Kaizen philosophy to its employees. The new breed of leaders recognizes that in today's complex business environment autocracy no longer works, yet the empowerment alone is not enough. Coaching aims to enhance the learning ability and performance of others. "Transformational leaders empower others by keeping them "in the know," by keeping them fully informed on everything that effects their jobs," says Brian Tracy. Some years ago, in locations throughout GE, local managers were operating in an insulated environment with Chinese walls separating them, both horizontally and vertically, from other departments and their workforce. Employee questions, initiatives, and feedback were discouraged. In the new knowledge-driven economy, Jack Welch, CEO, GE, "viewed this as anathema. He believed in creating an open collaborative workplace where everyone's opinion was welcome. "3 He wrote in a letter to shareholders: "If you want to get the benefit of everything employees have, you've got to free them – make everybody a participant. Everybody has to know everything, so they can make the right decisions by themselves." 25 Lessons from jack Welch: Involve Everyone.. 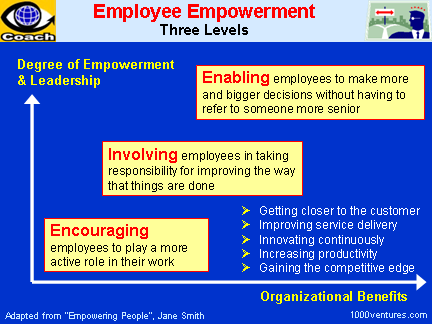 The way to engender enthusiasm it to allow employees far more freedom and far more responsibility. Victory comes from having a capable commander and the government leaving him alone.